Brain problem is an increasing epidemic in our society. In fact, you probably know someone, if not yourself, who is currently struggling with brain fog, trouble concentrating, anxiety, depression, forgetful, or even a condition like Alzheimer’s disease. One of the major causes of these brain problems many of us experience is the health of the gut. And you may have noticed a bunch of new studies pointing to the brain-gut connection and its important role in health. It is not uncommon that I see a patient come in for brain fog, while they do not complain of having digestive issues or only have some minor digestive symptoms, they symptoms subsided when they change their diet. It just goes to show that you do not have to have digestive symptoms in order to have digestive problems. Many are asymptomatic as far as digestive symptoms go but manifest as downstream symptoms somewhere else in the body. In fact, around 22 percent of people with gut problems can have significant damage to their small intestines but not suffer any digestive symptoms at all. So, could gut issues be the reason why you frequently forget where your keys or glasses are, or why you could not really focus on your work project? 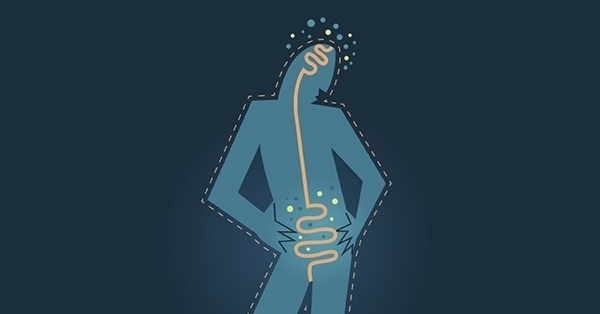 Research has often referred to the gut as our "second brain," and it is for good reason. When we are growing in our mother’s womb, our gut and brain are actually forming from the same fetal tissue. So, we actually have two nervous systems, the central nervous system (composed of brain and spinal cord) and the enteric nervous system (which is the intrinsic nervous system of the digestive tract). The enteric nervous system (ENS) cells line the digestive tract, controlling blood flow and secretions to help digest food. They also help us “feel” what’s happening inside the gut. These two systems are connected via the vagus nerve, the tenth cranial nerve that runs from the brain stem down to the abdomen. It is now well established that the vagus nerve is the primary route our gut bacteria use to transmit information to our brain. While many think of the brain as the organ in charge, our gut actually sending as much information to our brain as our brain sends to our gut. You have probably experienced the sensation of butterflies in your stomach when you're nervous, or had an upset stomach when you were very angry or stressed. The flip side is also true, in that problems in your gut can directly impact your mental health, leading to issues such as brain fog. By now, most of us are familiar with leaky gut syndrome (“intestinal hyperpermeability”), which happens when our gut lining is compromised. Anything that damage the gut lining and cause inflammation in the gut will lead to increased permeability. Increased permeability will further increased gut inflammation, then triggers inflammation in other organs & body systems. And while some inflammation in the body is necessary to fight off infections, ongoing chronic inflammation spells trouble for our health. Systemic inflammation surely affect our blood-brain barrier. The molecule microRNA-155 is elevated with increased inflammation and can create gaps in the blood-brain barrier, letting bacteria and other toxins slip through. Our brain’s immune system ends up working in overdrive to fight off these invaders and ends up creating more inflammation in your brain to try to protect it. Occludin and Zonulin are two proteins that govern gut permeability as well as protect the blood-brain barrier. When they are elevated, antibodies to these proteins can indicate damage to not only our gut but our brain as well. While there’s still much to uncover about the mystery of the gut and all it affects, here is what you should do to improve your gut health for better brain health. Avoid gut-damaging food such as processed food, high sugar, conventional dairy/meat/poultry, non-organic vegetables & fruits, unhealthy fats, gluten, unsoaked/unsprouted seeds, nightshades. Consume gut-healing food such as freshly prepared food, organic vegetables & fruits, spices & herbs, soaked/sprouted seeds, organic meat/poultry, healthy fats, fermented vegetables, bone broth. Consume all range color of fruits & vegetables, they contain different beneficial properties. Manage mental & emotional stress. Periodic gut ‘cleanse’ with herbs to support your gut function. Elimination diet to discover food sensitivities, relieve symptoms & heal the gut. Low FODMAP and GAPS diet for those with serious symptoms. Get treatment for any digestive problems such as food allergies, candida, parasite, SIBO, IBS, etc. Take gut-repairing supplement, when necessary, such as glutamine, digestive enzymes, collagen powder, glucosamine, etc. We don’t have all the answers on the gut-brain connection just yet, but one thing is certain, taking care of one part will reap benefits for the rest of our body.